When you are pregnant some of the normal, every day tasks that you are so used to performing may now pose a risk to your unborn baby. What may have been once harmless is now considered a hazard. Some things are common sense, while others you may not have even realised should be avoided. Throughout the website we talk about the common sense lifestyle changes that you should make for the safety of your baby such as stopping smoking, drugs and alcohol. There are also changes to diet and exercise that are detailed in their own articles eating for two, safe foods and exercise information that are very important factors to understand when you are expecting. As far as risks in pregnancy are concerned, there are many myths and unproven risks that you may hear about. I always like to play on the safe side of things regardless, and if you are concerned about anything that is unproven it is usually best to wait until you are out of the first trimester. Having said that, some things such as travel can be quite dangerous in the final stages of your pregnancy. If you are ever unsure about any potential risks to your baby, please seek advice from your medical carers. During pregnancy your immune system changes and can actually be weakened, putting you at risk of sickness that if you weren’t pregnant generally wouldn’t be a concern. Usually doctors will advise against immunization during pregnancy and will not administer vaccinations that are prepared with live viruses. 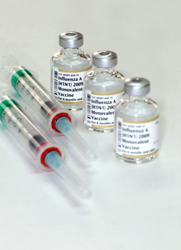 Even the flu vaccine should be avoided during pregnancy unless otherwise advised. While travelling when you are pregnant is mostly safe (we will discuss travel in further detail in a separate article) you should always think twice about travel to destinations requiring immunizations against infectious diseases. Drug use during pregnancy is of course something that is harmful to an unborn baby. It can lead to birth defects such as malformations, chromosomal damage and life-long damage to your baby. The chance of miscarriage is also increased with drug use. However what you many not understand is that this not only applies to illegal and “recreational” drug use but also over the counter and prescription medications. Some examples of this include the use of diuretics; used to rid the body of excess fluid: can potentially cause fetal blood disorders, morphine and other pain killers; can be addictive for your unborn baby: they can suffer from withdrawal symptoms, streptomycin; treats tuberculosis: can cause deafness in infants. Even paracetamol should be only taken in small doses. Remember that for most discomforts and some illness there are generally safe alternatives to drug use and these should be discussed with your doctor while pregnant. Before taking anything, consult medical advice and always inform them of your pregnancy. Simple things such as cleaning your home can now be dangerous for your baby. This doesn’t mean you should let yourself live in a pig sty! Simply be smart about the types of products you use to clean. There are many natural alternatives that are safe to use when carrying a baby. Read the label of anything that you use in your home. You will find that even after your pregnancy it is a good habit to get into. Natural cleaning products are much better to have around your home rather than lots of chemicals for the general health and safety of your family! Substances that give off an odor or vapours such as glues and petrol should be avoided, as they can be toxic. Inhaling these can be very dangerous for you and your baby. Hair colour is one of the unproven risks mentioned earlier. Colouring your hair is said to be safe. Some people suggest that it can be harmful while others say that there is no evidence to show that colouring your hair while pregnant is dangerous to the baby. It’s thought that no where near the amount of chemicals from hair colour are actually absorbed to have any dangerous affects on the fetus. However, it is advisable if you want to continue to colour your hair, that you do so in a well ventilated area, have someone else do it for you and wait until after the first three months of pregnancy when most of your baby’s crucial organs have been formed. Once again there are natural alternatives if you are concerned about harming your baby. What may seem to be 100% innocent and risk free, having a hot bath or using saunas and spas can be harmful to your unborn baby. Similar to fever, when subjected to extreme heat a baby’s nervous system can be affected and cause abnormalities. Remember that a baby cannot regulate their own body temperature until the last few weeks of the pregnancy. This is one of the main risks in pre-mature births. Avoid the use of spas and saunas, particularly in the first trimester and trade hot baths for warm baths to prevent risk to your baby. It goes without saying that drinking alcohol when pregnant can be harmful to your baby, however it’s not the only drink that should be avoided. 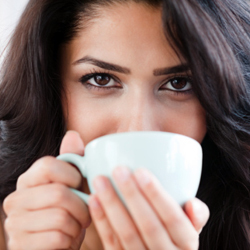 You should do your best to cut down your caffeine intake by avoiding coffee, tea and soft drinks that contain caffeine. Decaf tea and coffee is a great alternative for those of you that can’t go without your morning cuppa. Herbal teas are generally a safe alternative, however you should avoid drinking raspberry leaf as it is said to trigger contractions. Reducing your sugar intake is also very important and will help you to avoid gestational diabetes (read more about this in week 26 of pregnancy). You may think this is quite amusing to list as a risk, but socializing and the people you come into contact with during our every day lives can be dangerous for your baby. By no means should you become anti-social and hide out in your home away from the rest of the world, but you should be vigilant especially around children and people running a temperature. Infections, colds and flu are all things that you should be wary of especially since, as mentioned earlier, having a flu shot isn’t recommended for pregnant women. While colds and flu will not harm your baby a fever can be dangerous. Speak to your doctor if your temperature becomes high, for safe methods of reducing fever. There is some evidence to show that certain virulent flu viruses can cause miscarriage. To be safe, in the first 12 weeks avoid contact with anyone, especially children running a fever. If you get mumps when pregnant it will run its course however you have a slightly higher risk of miscarriage if you contract this disease during the first 12 weeks of pregnancy. Remember due to the mumps vaccination being a live virus you will not be able to have this immunization during pregnancy due to harmful affects on the baby. Chickenpox while uncommon among adults, can cause fetal malformations, another reason to avoid contact with children and adults showing signs of fever in the first trimester of your pregnancy. Toxoplasmosis can be very dangerous and cause serious damage to an unborn child, causing brain damage, blindness and can even be fatal. It is carried in the faeces of infected animals and in particular our fuzzy friend the cat. However most people get it from eating undercooked meat. If you feel that you could be at risk for toxoplasmosis (in particular cat owners) you can have a blood test to check. Ask your doctor to include this during your first blood test to confirm your pregnancy. 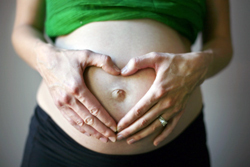 There are some simple things that you can do to lower your risk of infection while pregnant. Never eat raw or undercooked meat, in particular rare steak, steak tar-tare or pork. 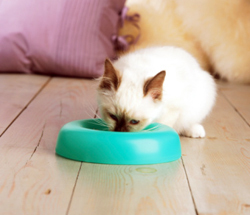 Don’t feed raw meat to your cat or dog and keep their food bowls away from everything else. If you don’t want to change your pet’s diet have another family member take care of feeding them. Never empty your cat’s litter tray without first wearing gloves and using a poop-scoop. Wash your hands with disinfectant directly following any contact with animal faeces. If possible have another family member look after the cleaning and emptying of the pets litter tray during your pregnancy. Always wear gloves when gardening and take care around fertilizers and where cats may have been in the garden. Wash your hands after handling and petting your pets and following gardening and food preparation, especially when handling raw meat. Cook all meat to a temperature of at least 54 degrees Celsius internally, using a meat thermometer to be certain. This will kill all bacteria. For more information about food safety refer to the Safe Foods article. For most people, continuing to work when pregnant is a necessary part of life and therefore you need to ensure that you do not take any unnecessary risks while in the work place. How safe your work place is and whether you continue to work and for how long will depend on your job. If your job involves strenuous activities such as a lot of standing, walking, lifting or climbing, you may have to think twice about continuing to work. However, in most cases you will be fine to go about your every day life. School teachers should be very diligent about sending home any child that may be feverish, to avoid previously discussed risks from cold, flu and fever. Your health care provider my suggest that you cut back the work that you do or transfer to a less strenuous job. You may also be advised to stop working in the weeks leading up to your EDD. You should never expose you and your baby to physical danger. Your work place by law should be understanding and accommodate your pregnancy. There are many factors to consider when travelling during pregnancy and will vary depending on the method of travel, where to, how long and at what stage of pregnancy. Due to the amount of information, travelling during pregnancy will be covered in detail in a separate article.